The low sun illuminates these bags filled with freshly plucked tea leaves, creating a contrasting effect of light and shadow. The men work quickly, emptying the bags and spreading the leaves out on withering trays, so that there is no risk of them fermenting. 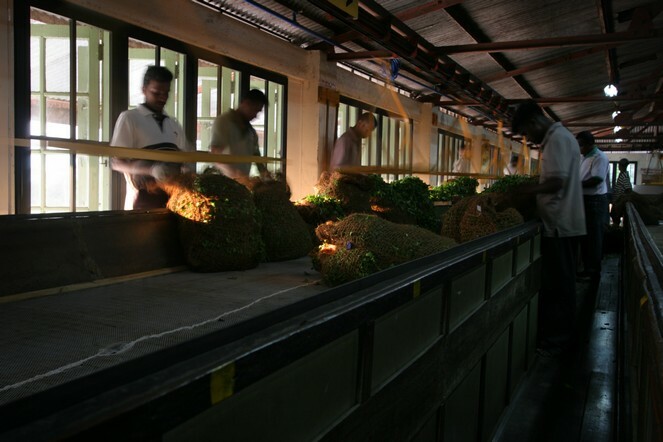 In some regions of Sri Lanka, tea is harvested at this time of year. Hello, I’m a frequent reader of your blog! I happened to be in Badulla and Nuwara Eliya region just this week. The Northeast monsoon brought a lot of rain to the hills, and affected much of the tea harvesting in Uva, Nuwara Eliya and Kandy. So I’m just curious, and also pleased to know that you are in Sri Lanka now too.